Hi there! Today I am combining two posts because they go so well together. This is my second week participating in the 40 Great Nail Art Ideas challenge. I was looking forward to this week's prompt- "film"- because I love movies and the possibilities are endless. I was also looking forward to sharing with you this awesome Hehe stamping plate that I was sent for review. If it's not obvious to you already, the film(s) I chose was the Harry Potter series. Can you see how the theme and this plate were made for each other? Accio awesome nail art! Hello lovelies! Today the ladies and I from Paint All The Nails are coming together once again for our monthly themed nail art linkup. Are you as excited as I am? Well let's get right to it! This month's theme is "Pantone Color Of The Year". This year there were actually two Pantone colors chosen. The colors are Rose Quartz and Serenity, otherwise know as pink and blue :P.
Great news guys! I have a new computer! A friend of ours built it for us, wasn't that so nice? Thanks dude (he's never going to read this)! Only thing is, I still need Photoshop installed, and an auxiliary camera card reader. So for now I will be showing you another post I've had saved up in my draft file. Why haven't I published it yet? Good question, I don't really know why. You can tell how long I've been hanging on to this though by looking at how GREEN the grass is in the background. All of my outside photos have white backgrounds now, haha. Happy Monday everyone! How was your weekend. I had a fun time with friends and family, it's a little sad that it's at an end. At least I'll have some keepsakes in the form of (what I know will be amazing) family photos taken by my very talented cousin. Back to the blog- I am still computerless. I have high hopes this will be remedied soon. In the meantime I have these photos that have luckily for me been sitting in my draft folder. Typing this out on my phone is limiting so again I will be brief. Today's nail art is a simple look created with three piCture pOlish shades and nail vinyls. PiCture pOlish makes some amazing blues and I wanted to show some of them off together. This was originally a possible entry for last year's PP Nail Art Quarterly. With some help from a friend, I chose to enter this look instead. This mani has been sitting by the wayside ever since. I still like how it turned out though and hope you do too! Hello everyone! I am excited about today's nail art because it is part of a challenge that I have just joined in on. This is my inaugural post for the Crumpet's Nail Tarts 40 Great Nail Art Ideas challenge. The idea behind the challenge is that everyone gets the same prompt (today's is "3 shades of purple") and then your assigned a more specific prompt out of the list of 40+ ideas (I was assigned "geometric". I like how structured it is, and yet there's still plenty of room for interpretation. So I would like to tell you more about my mani and so on but this is proving to be a bit difficult at the moment. I woke up this morning and found my computer won't turn on! I made the unfortunate choice of leaving the writing until the morning. I'm just glad I was able to edit and include the photos last night! Anyway writing this on my phone is proving to be a challenge as I don't really use it much in the first place. So enjoy the pictures! Hello my dears! Today I have a collection that I have SO been looking forward to sharing with you! 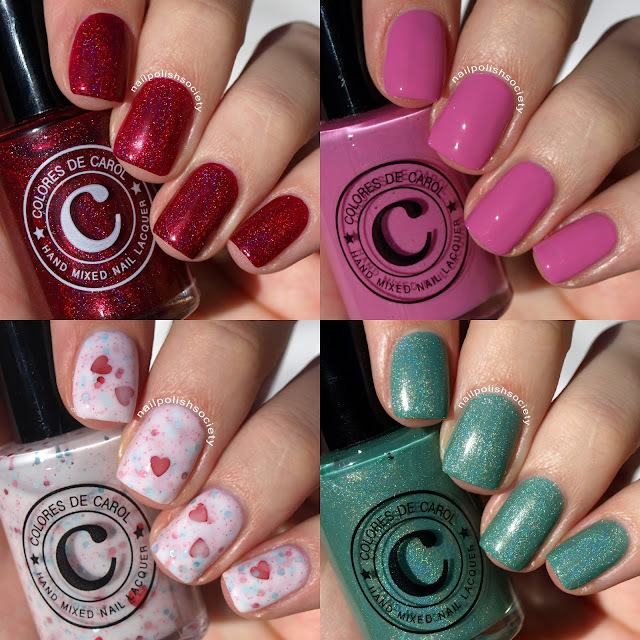 This is the Colores de Carol 2016 Valentine Collection, comprising of four polishses. At first glance it looked similar to last year's collection. Then you get a glimpse Single Lady, an unexpected sea foam green holo. The other outstanding difference to me is the inclusion of an oh-so-squishy pink creme/jelly. There's more, but I'll get to that in a moment. Hello my dears! Today I have an attempted recreation of a YouTube tutorial by Very Emily. Emily has recently started her own YouTube channel and I've had so much fun watching all of her videos. YouTube has never been a go-to place for me. I just don't spend that much time on it. But I have enjoyed watching Emily's videos and started to think that maybe I've been missing out. I really appreciate how simple, straightforward, and short they are. And of course, in case it needs mentioning, they are totally beautiful! Hello lovelies! I have another piCture pOlish to show you today! This one is a 2014 collaboration shade created with the amazing talent that is Sammy of The Nailasaurus. She is another blogger that I follow religiously and try to emulate in her well thought-out nail art, among other things. I was so captivated by this shade when it came out and just knew I'd love it once I finally got my hands on it. You can read all about Sammy's inspiration for her collaboration here. Hey there! I have some gorgeous polishes to show you that I just acquired a few days ago. 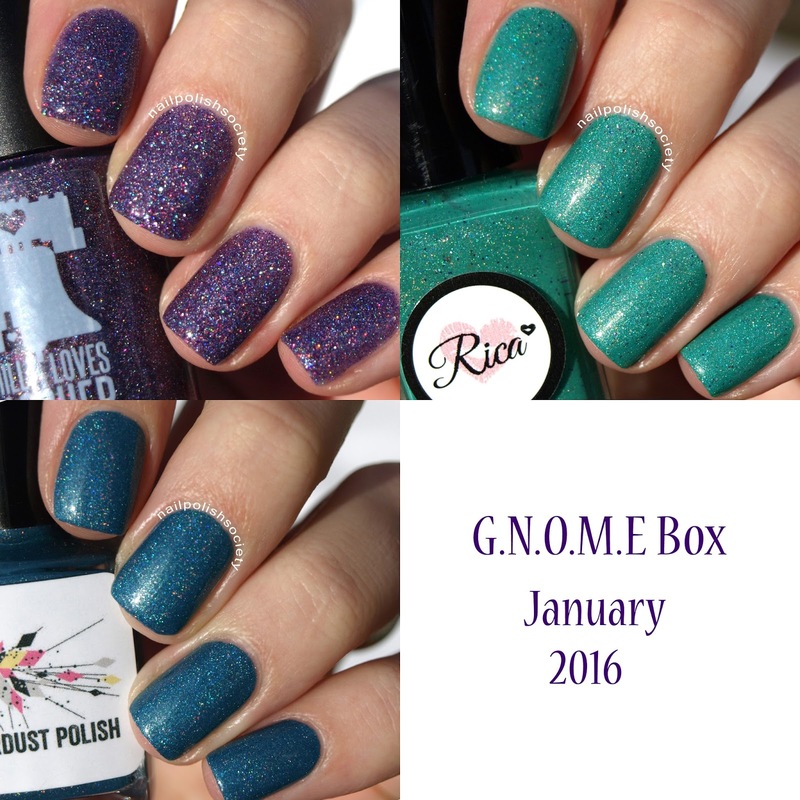 These three polishes are part of January's G.N.O.M.E. (Glitter Nerds Of Magical Existence) Box. I had never heard of this box before, I had gnome idea it existed. Apparently it is a regular collaboration with the makers Stardust Polish and Rica. I got turned onto this box because of the guest collaborator this month, Philly Loves Lacquer. The PLL polish was too stunning not to notice! I've tried the brand before and was pretty sure it would be a win (I swatched her Spring collection last year). I have been wanting to try more indie brands this year and I thought this would be a great chance to check out a couple more. These don't officially go on sale until Friday the 15th, but they had a kind of pre-sale on Saturday and I bought mine then. I was super impressed that they arrived in the mail two days later! Hello there! Today I have cute and wintry mani for you. If you don't recognize it already, this is recreation of Cubbiful's adorable Polar Bear Nails. When I saw her mani I fell in love with it with many audible "awww"s from me. I decided to be brave and try it myself. And while I still enjoy Mina's version better, I think my effort is commendable. A few weeks back Alison from ALIQUID Lacquers had a nail art contest with the theme "Young At Heart". I gave it some thought on what that meant to me. The one thing that came to mind when thinking about what makes me feel young at heart was climbing trees. In my original Instagram post I wrote, "One of my favorite childhood pastimes was climbing trees. If you couldn't find me, I was probably up in a tree. I was quite the tomboy back then. On the rare occasion I will still find myself high in the branches of some tree looking out through the leaves and it brings me back to more innocent days." Hiya there! Today I bring you another lovely piCture pOlish shade. This hot and sassy polish is named Allure and is a collaboration shade created with Instagramer Nina_D83. I love seeing collaborations done by artists that I follow and that inspire me. And if you're not following her work, you seriously need to check it out! My first nail art of the new year! Well actually I did this mani about three weeks ago but haven't had any time to edit photos and write a post. I thought I was mostly prepared for the holidays but as usual I was wrong. Now that things have chilled out a little I am hoping to be more active on my blog! This was the first time using my new A England Wuthering Heights and Cathy. I had swooned over photos of these polishes for months. Then I finally bought them and it still took a few weeks to try them out. Let me tell you, they did not disappoint! I'm still so, so in love. I had two different ideas for this mani, so I decided to try them both. Happy New Year my wonderful Society Sisters!! The best of wishes to you all! Today's post is a brief reflection of this past year and my hopes for the year to come. I considered doing a roundup post for the end of the year, but I didn't feel like there was a whole lot to roundup. Instead I'll do a short list of the best moments of the year. An obvious benefit to moment #1 is not being pregnant any more! Seriously, why do pregnancies take so long? 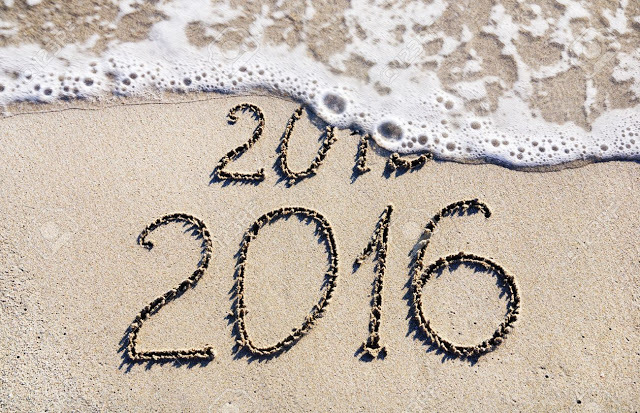 Now that 2015 has been succinctly summed up, I would like to start looking forward to 2016. This is a tricky one for me because I'm trying to figure out how high to set my sights. I mean, I believe you can only succeed as far as you set your goals. At the same time, I don't want to be more disappointed with all the things I'm not able to accomplish. So I'm going to start with some more achievable goals before I get too deep. I'll admit, I'm kinda a wuss when it comes to failure. I want to spend more time on my blog this year. I want to improve my nail art, swatches, photos, layout, consistency... basically everything. Just how I'm going to achieve these things I haven't figured out yet. Until then I'm going to try and have a great attitude and lots of hope!